I originally picked up Prime #1 because he was a red headed Superman who at his core was an inexperienced kid with a warped sense of ‘right’ - but that was going to be it. Forget this "Ultraverse", I was too busy juggling Wildstorm, DC, Vertigo and Marvel! The caption in case you can't make it out; "Lukasz the eternal warrior has died many times. As an elite foot-soldier in the eternal battle between good and evil, he has been reincarnated into the never-ending fray over and over. This time Lukasz has been brought back as a woman - permanently. And to make matters worse, her only ally is Warstrike, the man who killed him in the first place!" And that, ladies and gents, was that. From there on, it was "What about Wildstorm, DC, Vertigo and Marvel? I’m having a hard enough time juggling the Malibu’s Ultraverse!" Mantra introduced me to Terry Dodson, horror comic Rune to Barry Windsor Smith, and Sludge to Aaron Lopresti. Meanwhile Prime reacquainted me with Norm Breyfogle, The Strangers with Steve Englehart and UltraForce with the madly talented George Perez. 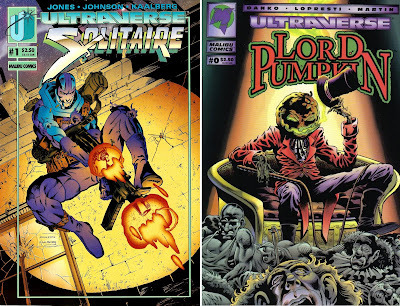 All the Ultraverse books were helmed by legends, or those who have gone on to become one - and that excitement showed though in the titles. 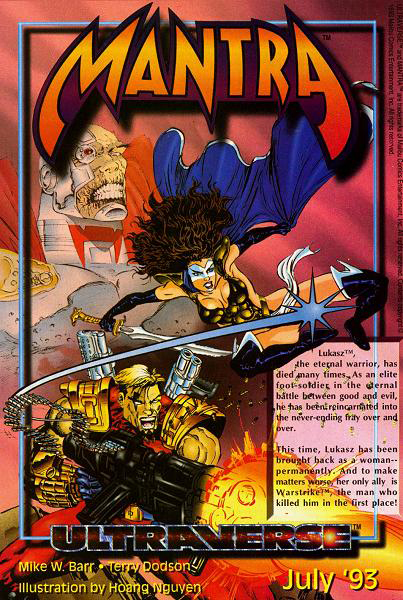 As the buzz of the industry moved to ‘realisim’, the Ultraverse roared in the opposite direction, twisting comic stereotypes and increasing the imagination factor with crossovers like Break-Thru and concepts like Lord Pumpkin, and NecroMantra. Prototype became a favourite as the kid inside the Iron Man-ish armour realised he was being played by corporate powers, but Prime always remained at the top of the heap. 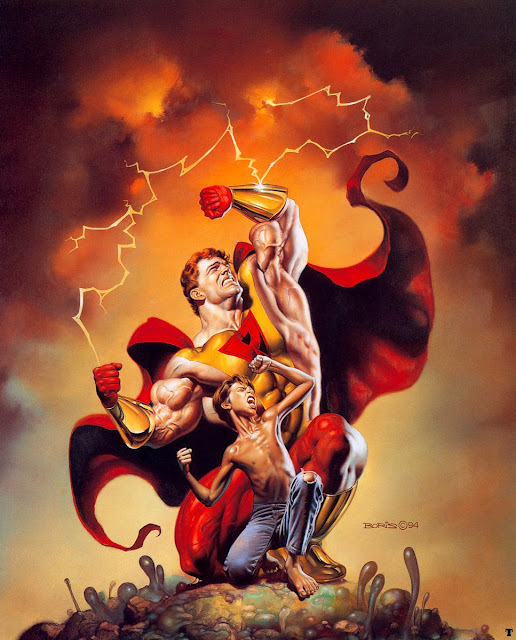 Infact had Marvel not purchased the Ultraverse in 1994 and needlessly reinvented concepts like Mantra, I probably would still find myself saying the same now. They may seem like odd comics, sitting unrecognisably in your local comic store's back issue bin, but take a chance on a few next time you are in a random mood. Something tells me you’ll be glad you did. Well these posts of your's got me thinking about the 90's and I got nostalgic, thinking about highschool, college and summer vacations, hair and music, books and comics, friends that are not the same anymore. Take That! You are going back a bit Aliera! Mind you they are back with Robbie again now it seams so you might get to relive the 90s more than you thought! Friends that aren't the same anymore - that's always a bittersweet thing to reflect on isn't it? I think for my the 90's were comics, Rick Dees and the weekly top 40, drawing, friends,the beach and comics - see we are almost twins! Thanks for the awesome comments once again! Yes Robbie is back and I'm glad for it. Life goes on. And people change with it. It's sad, but... yeah. The good thing is: now we have comics, beach, music... and internet, so I can speak to a person in NZ that shares my love in those things. Amen to that Aliera! Glad to have you as a friend on IADW! Hey Dan! Shag here! It's been ages, but I just had to share this with you. Think it might make you happy. Thanks Shag - that is awesome! !